SlabTight Shield is a coatings primer and vapor barrier, all in one. It acts as a protective coating to help reduce damage to color coverings and decorative coatings. It protects surfaces from damage caused by high pH levels, water vapor as well as salt transmission. SlabTight Shield is extremely resistant to moisture transmission. It prevents the diffusion of vapor and gases. Failures in laminated and decorated flooring in the US result in the spending of over ten billion dollars every year. You can protect yourself from costly repairs by applying SlabTight Shield. Protect yourself from the expense of repairing damp carpets, peeling paints and epoxies, failed concrete overlays, delamination of tiles and buckling wood floors. What makes SlabTight a great choice? SlabTight Shield dries and cures quickly when applied. This reduces the cost of labor. 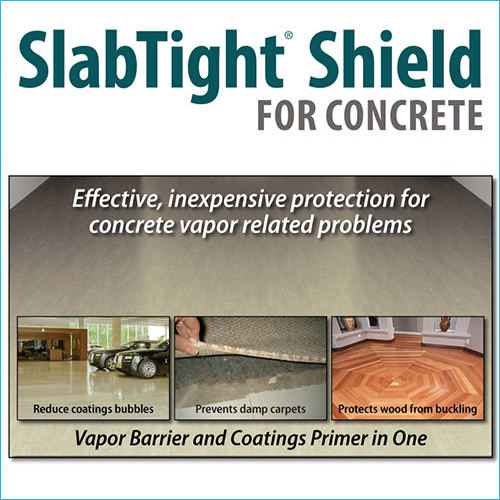 SlabTight Shield is compatible with a wide variety of floor adhesives and decorative coatings. No special treatments are required for surface preparations. You only need to ensure that the surface is clean. SlabTight Shield provides long term protection for surfaces. Protect carpets, epoxy, concrete, wood laminate and tile from moisture damage. Application of SlabTight Shield does not require specialized training or skills. No mixing is required. Simply apply using a roller. If you’re on a tight budget, then SlabTight Shield is the perfect solution for you. It is an affordable solution that costs no more than 35 cents per square foot. Not only will you save money immediately but will also save money in the long term on repairs. SlabTight protects surfaces and prevents failures that require expensive repairs to correct. SlabTight Shield provides durable waterproofing. It is also effective in rack repair. SlabTight Shield balances pH at 4.5 to improve bonding with overlays and epoxies. SlabTight Shield is VOC free. It is water-based and free of odors, making it a great choice for indoor and outdoor use. SlabTight Shield is a salt and gas vapor blocking sealer. When it cures, it causes the appearance of the substrate to change as it forms an amber film on the surface of the substrate. This film is vapor resistant and compatible with a wide variety of floor adhesives and decorative coatings. Use SlabTight Shield for long term protection of surfaces.